Oh I want it!!! I hope they have size extra small. I am not buying any of that crap if it has that ugly picture on it! I want to buy that one.. I like most of that. That shirt and the poster they sell are the only real tour related stuff I saw....other than that it was mostly stuff from the website. they were selling two shirts from the website, the mug and some other stuff. 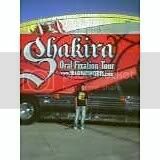 September 2nd, 2006~Shakira Atlantic City, NJ~Old best night of my life! 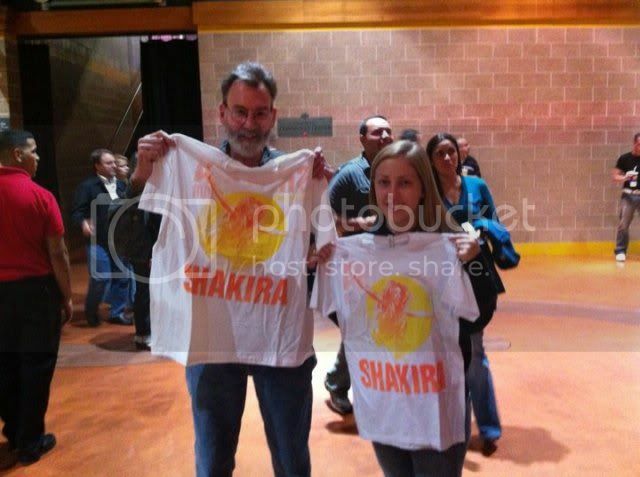 September 17th, 2010~Shakira Mohegun Sun, CT~New best night of my life! Shaki leaned over the catwalk and handed me a yellow rose. She had the smile of an angel. I'm definitely buying the SW mug! hopefully at the ny show they will have more stuff. These shirts purchase only real fans. Haha, you'd all prefer a black tshirt full of blood stains and a pair of plastic fangs together with My Chemical Romance CD? I think the t shirt is so fresh and clean, ah, ah, I like it... very summery, I think it suits all skin colours too. Bummer they ain't selling more stuff though... LN seems like another disappointment. no tour book so far? Package buyers get a special lithograph. Does anyone have theirs yet? Let's see. They promise a photographic report about the events in Spain in conjunction with the premium tickets. Maybe it'll be exclusively produced for every single event. BTW When does the concerts start in US? The concert in Barcelona starts not until 10.30 pm. Is the mug the one that changes color if you put something hot in it ?! The merchandise basically is almost the same as the one they have on her official online store. I bought a nice poster, I'll post the pics later. i want a Pies Descalzos shirt sooooo bad! It's the PD foundation shirt... which I'm not really excited about... I admire her foundation, but I'd rather a PD album shirt. ill buy a PD shirt and a SW shirt. Nope, it's the regular She Wolf mug with her face on it like that pin. I do have the changing color mug though! And in all honesty, the tour t-shirt with the Loca picture on it is MUCH nicer in person. I wasn't sure about spending the $35 to get it at first, but I did and wore it around yesterday. The shirt is sooooo bright and attracts a lot of attention (I think it looks great on me!!!). The only flaw to the shirt is the white lettering of the tour dates within the big yellow "sun" on the back. It's too difficult to read (shows up great in my pictures though because it was dark out ... difficult to see in sunlight). Orange lettering would have worked much better. But overall, I absolutely love the shirt! First the whole Sun Comes Out mood. Edited by disneyreporter, 23 September 2010 - 01:41 PM. Thanks disneyreporter, I love that tshirt... too bad the dates on the back makes the tour look so minimal haha, I'd actually love to have one of the OFT with all of the dates included, up to the Turkey one. Does anyone have their goodie bag from the ticket packages?! Why can't I get an answer on this? !